From left: Timmy Brock, Pat Earley, and Jimmy Brock. 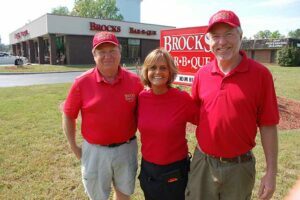 Brock’s Bar-B-Que Restaurant & Catering is celebrating 30 years in business Friday. The date was May 12, 1987. Charlie and Doris Brock and their two sons, Jimmy and Timmy, opened their doors at the Water Tower Shopping Center. They stayed at that location for 13 years before moving across the parking lot, and remodeling a former bank building, where they have been for 17 years. They continue with their family traditions, recipes, and reputation for good service and quality food. Jimmy and Timmy became the second generation to run the restaurant and catering business when their parents retired 18 years ago, and now, children of former employees are working in the restaurant. One of their servers, Pat Earley, has been with them for 22 years, and three other servers are children of servers who worked in the early days. “One of our customers, John Osborne, has been with us since we have opened our doors and has his own reserved spot in the restaurant when he comes in for lunch,” said Jimmy. Timmy manages the successful catering business, which provides food for some of the largest corporate gatherings, some in excess of 8,000. Jimmy manages the restaurant, which reflects family; not only does it include the quality selected and how the food is prepared food, but it is emulated through the staff and showcased on the walls of the restaurant, adorned with photos of family and friends as well as college flags representing the Brock’s schools. NASCAR photos showcasing Jimmy’s son Alex, a rising late model driver, are especially prominent. Many of the family recipes have remained the same over the years, including the green beans and coleslaw which were Doris’s family’s recipes. Brock’s may have earned its reputation for their barbecue and Charlie’s tasty sauce, but it is the whole delightful mix that keeps everyone coming back allowing the restaurant to celebrate their 30th anniversary. Look for some sampling going on all day long during their anniversary day as well as other activities. 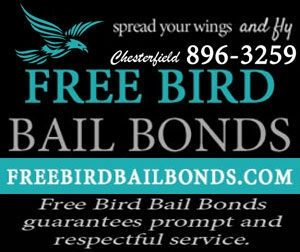 Brock’s Bar-B-Que Restaurant & Catering is located at 11310 Ironbridge Rd. 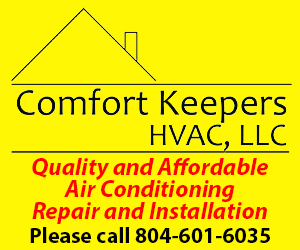 For more information call (804) 796-7539.